With students from the Film and Television Institute of India sticking to their demand for removal of TV actor Gajendra Chauhan as the institute's chairman, a second round of talks in Mumbai on Thursday between the striking students and the information & broadcasting ministry officials failed to break the deadlock but the two sides agreed to meet again in New Delhi on October 6. 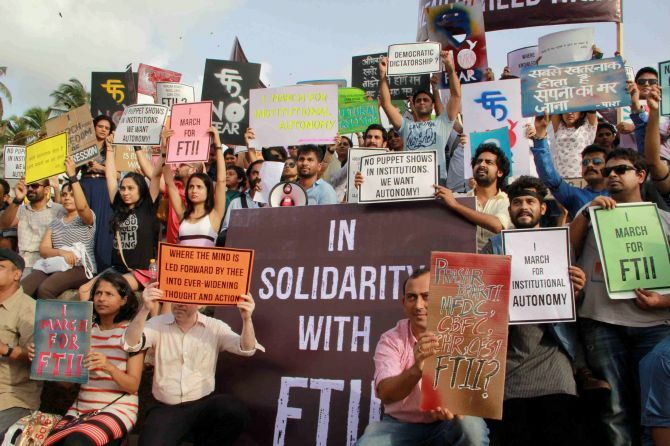 During the talks, which lasted for nearly four hours, students held firm to their 'core demand' of dissolving the Pune-based FTII society headed by Chauhan, who is also a member of the BJP. The ministry team was represented by Joint Secretary K Sanjay Murthy, Deputy Secretary Deepak Kumar and Films Division Director Mukesh Sharma. "The meeting we had today was in continuation of our last meet two days back. We have decided to further continue our talks on Tuesday (October 6) in Delhi with the Secretary of I&B department," spokesperson of FTII Students Association Vikas Urs told reporters after the meeting. He said students in the meeting stuck to their core demand of 'dissolving' the current FTII society. "We asked them to dissolve the current FTII society and come up with a transparent process set up by a committee of experts, which will make norms and guidelines for the formation of a new society. Until that happens, we want the current society to be put into a passive state or to be dissolved altogether," he said. When asked on the response of the I&B officials on their demands, Urs said they are helping officials understand the issues. "They are still trying to understand our demands and we are helping them understand the issue. We are helping each other understand the issues faced by both sides and get more clarity so that a mechanism can be set up to settle the impasse," he said. Urs said officials from the ministry have not put forth any proposal as yet, but they are keen on resolving the issue. "What's needed is that the government should respond to our stand in a pro-active manner. But the best thing is that they themselves are proposing more meetings with us," he said. He said that talks between both sides are extending because issues are complicated but efforts are on to reach a conclusion. An I&B ministry-appointed committee had visited FTII's Pune campus on August 21 and held discussions with students, faculty members and the alumni association. The agitating students called off their 18-day-old relay hunger strike last Sunday (September 27). Students have been boycotting classes since June 12, protesting against the appointment of TV actor and BJP member Gajendra Chauhan as the institute's chairman and demanding his removal.